… and it is, except that we do something a little different than most people seem to these days. You see, we’re pretty picky about our sauce. We have found a few store-bought pasta sauces that we like, but they’re often $5 a jar or more. That’s a lot of money to pay if you have pasta with any regularity. Our solution, of course, is to simply make the sauce ourselves. This solves several concerns all at once. It gives us complete control over the ingredients for health and flavor concerns, but perhaps more importantly, it reduces the cost of a meal’s worth of sauce down to approximately the same cost as the absolute cheapest pasta sauce on the shelves. In short, we can make pasta sauce at home that’s tastier and more appealing to us than any canned sauce we’ve found – even the $5-10 sauces – for less than $1 per jar (about $1.80 or so if you include lean ground beef in it, as we do). The trick, of course, is that we make several batches of it at once and freeze all but one of them. In this example, we’re making five “jars” of sauce with a set of ingredients that’s just shy of $5. A few notes on the ingredients, before I list them. The ground beef is entirely optional in this recipe. 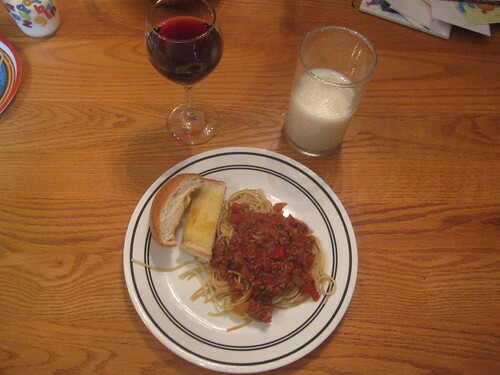 If you want a meat sauce, use it. If you don’t, don’t use it. We used about 2.5 lbs. 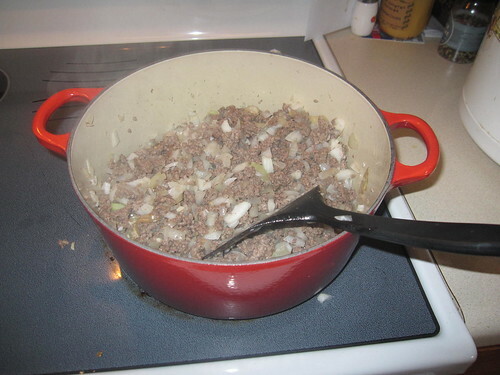 of ground beef in this recipe, averaging out to about 8 ounces of it per “batch,” or about 2 ounces per dinner plate for our family. I’d recommend using 2.5 pounds. Second, we used canned diced tomatoes and sauce because, frankly, the fresh tomatoes aren’t quite here yet in Iowa. In about a month, we would be using fresh tomatoes for all of this, but the tomatoes currently in the store are still what I would consider ridiculously expensive. If you want to use all fresh ingredients, wait until tomatoes are in peak season and use fresh tomatoes for all of it. The price will be very reasonable and the flavor will be sublime. You can, of course, add any other vegetables and spices you like. Chopped peppers are a good addition, for example. 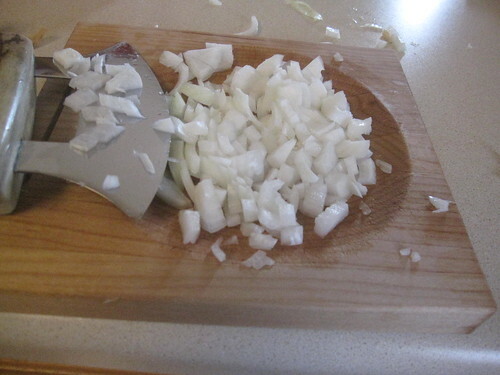 First, we chopped up the onions. We use an ulu knife (a gift) for this. It’s a special type of knife with a rounded blade that makes chopping vegetables quite easy. 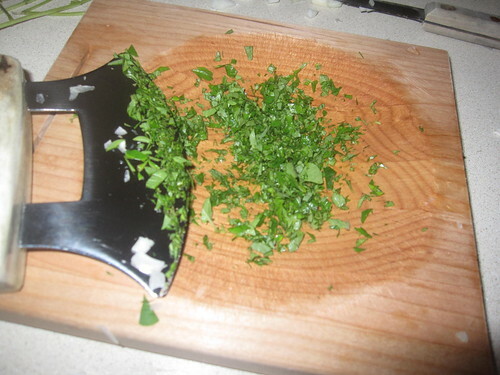 You basically grab the knife by the handle and rock it back and forth on the board – it chops vegetables quite well. We used fresh herbs in this. If you don’t have access to fresh herbs, dried basil and oregano work just fine. We just happen to have oregano all over the place this year (oregano sometimes just goes crazy in an herb garden), so we might as well use it. Stir it well, then let it simmer for 45 minutes. If you’re using mushrooms, add them after thirty minutes of simmering. 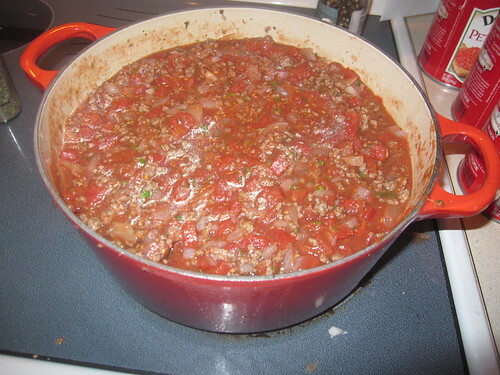 Here’s the sauce after most of the simmering is finished. These freeze up really well. If we want to have a pasta meal – or a homemade pizza – that night, we just pull a bag out in the morning and stick it in the refrigerator. By evening, it’s ready to be warmed up to the desired temperature and still tastes great if used within six months or so. As for the meal itself? It was delicious. We had bread on the side with it (and some yoghurt after the meal) and it went over very well. We had a small amount of sauce left over, so we also made a lunch that consisted of the remaining sauce and a bit of the remaining pasta. What did the sauce cost? Here’s our cost on the ingredients. With the meat included, it totaled $10.05, so when you split it into five batches, each sauce batch cost $2.01. 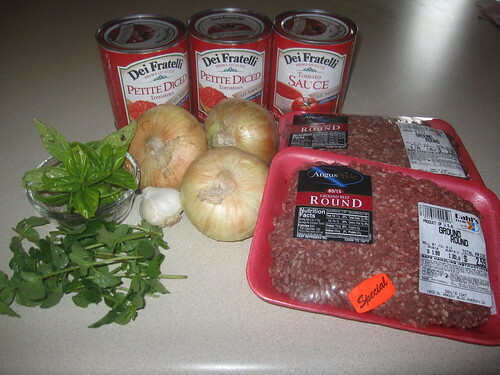 Very good for hearty sauce with meat. 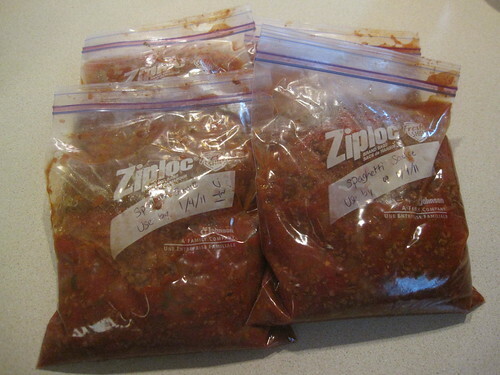 Without the meat, it totaled $5.82, so when you split that into five batches, each sauce batch cost $1.16. That’s incredible, considering similar sauces at the store would easily be $5 a batch. We dearly love this stuff and prefer it to any store sauce we’ve tried. Over the course of the five batches, if you’re normally buying large jars of gourmet sauce at $5 a jar, you’re saving $3.84 per meal. Over the five batches you made, you’ll save $19.20 – not bad for less than an hour’s work!